Gough Whitlam, who died today at the age of 98, was my first Australian hero. It didn’t take me long to fall in love with the Australian Labor Party and its leader, Gough Whitlam. I grew up as a Democrat in the United States, and the ALP and the charismatic EG Whitlam stood for everything I believed in: Medicare, multiculturalism, free university education, Aboriginal Reconciliation, a revival of the Arts, an independent foreign policy and a recognition that the Vietnam War was a failure, to name a few. I’ve written about Gough before so please excuse some repetition. http://wp.me/p1Ytmx-aC (Yes, I know my previous post repeated a bit, too. But I had to write about Gough Whitlam. I promise to keep it short!) Gough also had a wonderful sense of humour; in fact Deane Wells compiled his bon mots in a book entitled The Wit of Wisdom (Outback Press). Combine all these policies and qualities and compare them to what Richard Nixon stood for, and you can see why I was a big supporter of Gough Whitlam. Okay, Whitlam’s economic policies weren’t the best, given the Iraqi Loans Affair, in a bid to finance development plans, which was an unmitigated disaster for the government. But give me Gough any day. At this point, the former Prime Minister boomed down the line in that distinctive voice: “Your credentials are improving!” Gough Whitlam eventually appeared on the program on the 20th anniversary of Sunday, November 18, 2001. He was, as always, a tremendous guest. 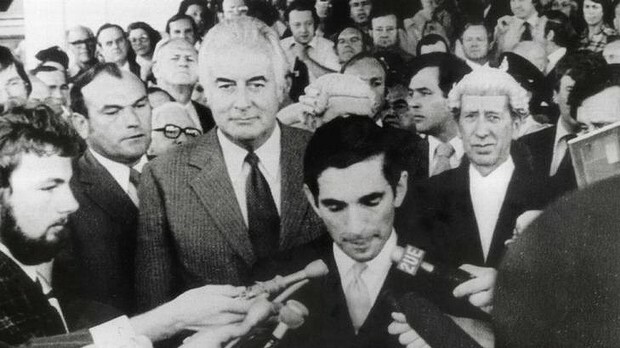 When Gough was dismissed as Prime Minister by the Governor-General, John Kerr, on November 11, 1975, I was devastated, along with most Labor supporters (see photo below of Whitlam on that day as the G-G’s secretary reads proclamation dissolving parliament). I maintained the rage as he requested, but the paper I worked for, The Australian, was a leader in the campaign to make sure he wasn’t re-elected in 1975. The journalists were so angered with the anti-Labor bias, we even went on strike for a day in protest against the coverage. As a result, I was not a fan of Malcolm Fraser who defeated Gough in that election, but the former Liberal leader has now become a statesman and backs many of the policies Labor did then. As I’m writing this, I’m listening to Mr Fraser describe Gough Whitlam as a “great Australian” on the ABC. One great Australian talking about another great Australian. I never thought I’d say that about Malcolm Fraser in 1975. I said I’d keep this short so I have one more story about a conversation I had with Gough Whitlam. When I was editing the book pages for The Australian in the early eighties, a political volume — perhaps one about the dismissal — landed on my desk (sorry, I can’t remember the title). The only problem was the pay rates for reviewers. The Australian paid $50 for the review, and of course, the book was free. I didn’t tell him the rate, knowing it was pathetic, even for the early eighties, I just asked if he could review it. He must have known the paltry sum, as he said: “Yes, but I have to tell you, I must ask for a dollar a word.” I told him I’d get back to him. I went to see then editor Les Hollings, and asked if I could pay Gough a dollar a word. Les looked at me, smiled and said: “No, Tom, definitely not.” Les was not an aficionado of Gough, but you could have guessed that! So Gough Whitlam did not write for The Australian literary pages when I was editing them. I do remember sending the book to Sir Howard Beale, a former Liberal Party minister and Australian Ambassador to the United States, who didn’t mind reviewing for $50. It’s ironic in a way as I’ve just heard the present leader of the Labor Party, Bill Shorten, who was married to Sir Howard’s granddaughter, and is now married to the daughter of the former Governor-General, Dame Quentin Bryce, pay tribute to Gough Whitlam: “A giant of our movement, a great leader of our nation, Edward Gough Whitlam has left us.” Mr Shorten was addressing the Labor Caucus, and he was followed by Gough’s long-time friend and colleague, Senator John Faulkner, who said his tribute was going to be “the most difficult speech I have made and will ever make in this Caucus.” Senator Faulkner, who made a two-hour television documentary with Gough for SBS (Special Broadcasting Service) in 2002 http://bit.ly/1FtnNgs, told the Caucus: “Gough Whitlam was a towering figure in our party and in our lives for as long as I can remember.” He also talked about the excitement and enthusiasm of the election campaign in 1972 when Gough was elected on December 2. It was in my experience as happy a day as the election of John F. Kennedy in 1960 after a long eight years of Dwight Eisenhower and the election of Barack Obama in 2008 after an even longer eight years of George W. Bush. Senator Faulkner also talked about the achievements of Gough Whitlam in modernising the party, making it electable, and inspiring a generation of Australians: “I am one of them,” he said, “and I know I’m here with many others in the Caucus today.” And he didn’t forget the wit of Whitlam either. Senator Faulkner said Gough was very pleased when the 2002 documentary was nominated for a Logie (the Australian equivalent of an Emmy Award). But he had to tell him the sad news that the Logies had informed him before the ceremony that the doco wouldn’t win: “Gough was crestfallen for at least five seconds, and said to me: ‘Comrade, I suppose an Academy Award is out of the question.” The Caucus laughed and so did I.
Goodbye, Gough. We will never see your like again. PS Readers of this blog who might want to know more about Gough Whitlam, here’s a link to an obituary written by Tony Stephens in the Sydney Morning Herald. http://bit.ly/1zipnBn There are many additional stories as well. My only an only interview with Gough was memorable and short. It was on the occasion of former ALP man and union leader Jack Egerton being nominated for a knighthood at the suggestion of a rather malicious Sir Joh Bjelke Petersen, who wanted to annoy the ALP, I was sent to get some words from the Great Man who was due to attend a public event in Melbourne. As he stepped from his car, I asked for his view on the proposed knighthood for the Labour “rat”. Gough stopped momentarily, peered down at me from a great height and imperiously stated “I think its about as appropriate as the ennoblement of Sir Toby Belch,” and then he walked off. Being not as well versed in literature as I perhaps could have been, I had no idea of the significance of the statement. I had to return to the office to discover that Toby Belch was a figure of some ridicule in Shakespeare’s 12th Night. Of course I was very knowledgeable on the subject by the time my news report went to air. My one and only treasured memory of an encounter with Gough. the Dismissal, his dismissal. Some would throw in the towel but to this day he lived a life that was all about contributing. Always the cup half full. He and his wife of seventy years, Margaret (The lady that, was said, could kick start a jumbo jet) were true states-persons and patriots of Australia. His legacy: ” Service to others is the rent you pay for your room here on Earth.” Quote by Muhammad Ali. Gough, for you, it is time. Give them hell on Olympus. And I’m sure Gough and Margaret are up there now, trading one-liners!